Esma Redzepova is well-known as 'the Queen of the Gipsies', a title given to her on several occasions, most notably at the First World Festival of Romani Songs and Music. She has sung for worldleaders and peasants, in big halls and on streets, with a magic voice that is so vibrant and exuberant as her charisma. Esma was born in a small village near Skopje, the capital of Macedonia, beginning her musical career with a suitcase that contained one dress and one dance costum. Tutored by her band leader, mentor and later husband, Stevo Teodosievski, she developed her talent, placing the fascination of her music against the racism that used to lurk along her journey from childhood on. "Music is the only luxury of the poor.." she said, "When you sing you have no evil thoughts and when you are dancing you feel less hungry.."
And she lived her passion in a way that hardly anyone could resist. 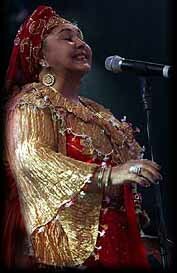 She became one of the greatest ambassadors of Romani music in the world, she travelled from one end of the horizon to the other, casting the spell of music everywhere. Cheerful and sensual, a knowledgable woman and a streetchild the same time, she is as colorful and timeless as the people whose torch she carries with so much pride and dignity. 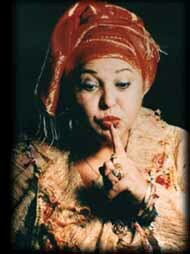 Esma Redzepova used the riches well she made with her music. Together with Stevo she adopted no less than 47 (!) Roma orphans and street children and gave them a musical training, she built a palatial house in Skopje which she called the "Home of Humanity and Museum of Music" and which contains a school, a health clinic and a gathering place for support groups. In 1995, she sponsored the 'Association of Roma Women' - ESMA - a self-help group for Romani women in her hometown of Skopje. The most tragical loss in her life was the death of her beloved husband Stevo which left her so devastated that she almost gave up her music. Fortunately, she recovered from her deep depressions and continued her career - most likely exactly what he would have wanted her to do, anyway. Unfortunately, the music of Esma Redzepova used to be available only on cassette tapes until not so long ago. In the meanwhile, there are CD's, but they are not always easy to find. The second CD - 'Gypsy Queens' - is a double CD-sampler whith several singers on it. Yet it contains some real rare and hard-to-find songs of Esma Redzepova. And yes, it's her image on the cover - too bad amazon.com could not even write her name correct in the title list..